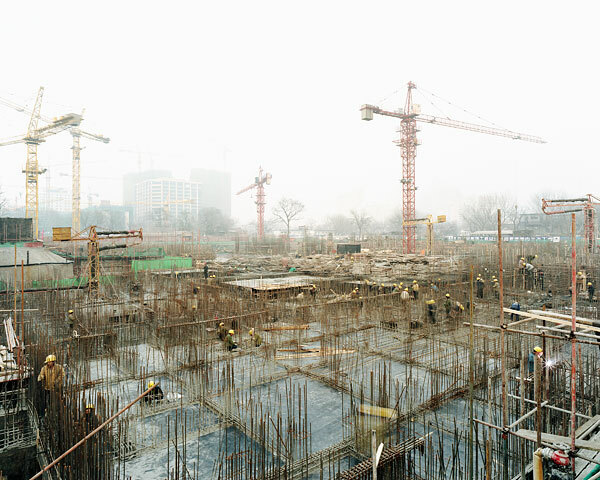 [Image: Construction in Beijing, by Sze Tsung Leong; read more about his work here]. New forms of international construction finance have been put to use, and sustainable building technologies never before seen on this scale are all part of the plan. “This is the biggest single development anywhere in the world, bigger even than the Beijing Olympics” – not to mention something of an embarrassment for the U.S. rebuilding of New Orleans. To help me avoid quoting the whole article, however, go see for yourself; and more can be found at the site of Arup, Dongtan’s engineers. (Spotted at Archinect – though BLDGBLOG has reported on Dongtan before: that post includes a look at other Chinese infrastructural projects, and is worth a quick read). There’s a kind of counter-argument – or at least a cautionary pessimism – about Dongtan posted at The Guardian, if that interests anybody. Shucks, I always that the people who keep rebuilding their houses in a flood plains where nuts… I guess they think that the one place a flood won’t look for them is at the mouth of the river??? It’s a fake-out. Architectural Chicken.